It’s been a while since I’ve had the time to try a new baking recipe. 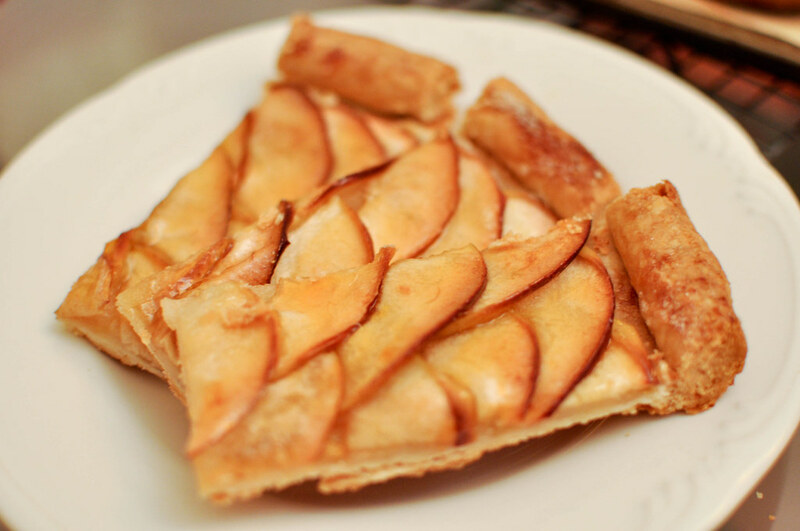 My mom made this apple galette a while back and after devouring four slices in one sitting, I had to ask her for the recipe. She had seen a clip on PBS from America’s Test Kitchen. Trustworthy source! The recipe (below) suggests using Golden Delicious, Granny Smith, or Empire apples. My mom told me she chose Golden Delicious because they’re softer and not as tart as Granny Smith. The first step is to prepare the dough for the crust. I didn’t want to buy instant flour, so I went with the 2 cups of flour+2 tablespoons of cornstarch. You just need to use a little more ice water if you do this. I’m terrible at cutting things into uniform sizes. One new thing I learned with this recipe was fraisage. One quick google searched showed me this. Apparently it’s a technique of rolling the butter into the flour but not overworking the dough to create a flaky crust. Before the fraisage method, the dough is crumbly like above. 4×4 cube, then chill in the fridge for a bit. 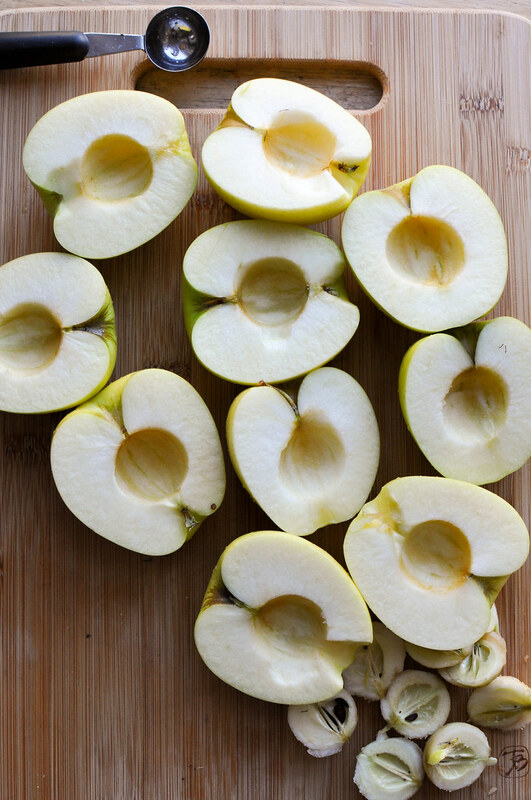 While the dough is chilling, prepare the apples. I used a melon baller to core the apples and got overly excited about how cute they look with the little round holes. This is where I failed. You’re supposed to peel the skin off the apples! Totally forgot that step. Also, it’s hard for me to cut uniform thin slices even with an extremely sharp knife. I want one of those vegetable/fruit slicers. I cut 5 apples but probably only used 3.5. Roll out the dough and create a wall on the sides. I need to make the corners prettier next time. 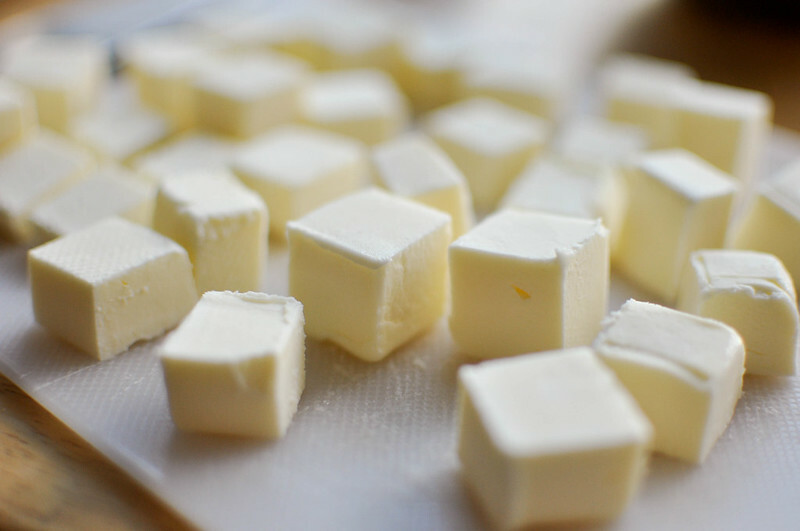 More butter cubes (but smaller this time). Sprinkle with sugar, and it’s ready to go into the oven! Brush the apricot glaze on. The second thing I messed up on was that somehow two bubbles formed in the dough so it burned a little. Need some vanilla ice cream! The galette can be made without instant flour, using 2 cups of all-purpose flour and 2 tablespoons of cornstarch. However, you might have to increase the amount of ice water. 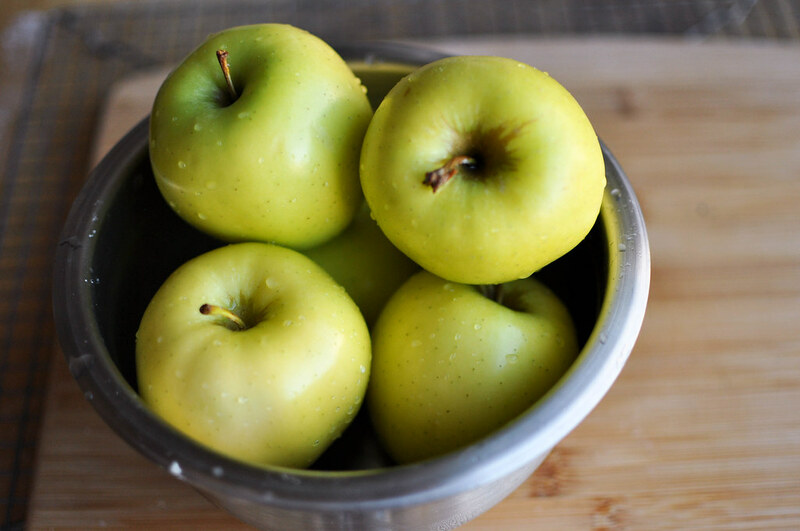 Although any apple will work in this recipe, we prefer Golden Delicious, Granny Smith, and Empire. 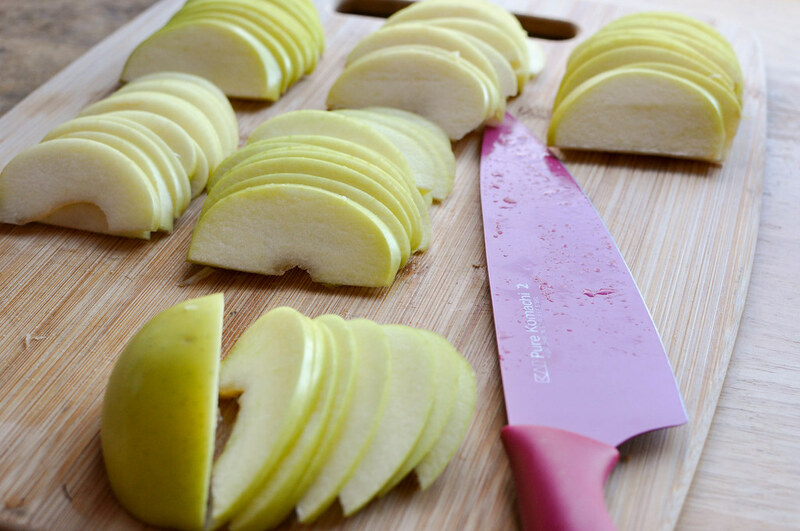 If you don’t have an apple corer, halve the peeled apples and then use a melon baller or paring knife to remove the core from each half. Make sure to cut the apples as thinly as possible. If they are cut thicker than 1/8 inch, they will be hard to shingle. If the dough has chilled longer than 1 hour, let it stand at room temperature for 15 to 20 minutes to soften. If the dough becomes soft and sticky while being rolled, transfer it to a baking sheet and refrigerate it for 10 to 15 minutes. Check the bottom of the galette halfway through baking-it should be a light golden brown. If it is darker, reduce the oven temperature to 375 degrees. Serve with vanilla ice cream, lightly sweetened whipped cream, or creme fraiche. 1. CUT IN BUTTER: Combine flours, salt, and sugar in food processor with three 1-second pulses. Scatter butter pieces over flour, pulse to cut butter into flour until butter pieces are size of large pebbles, about 1/2 inch, about six 1-second pulses. 2. 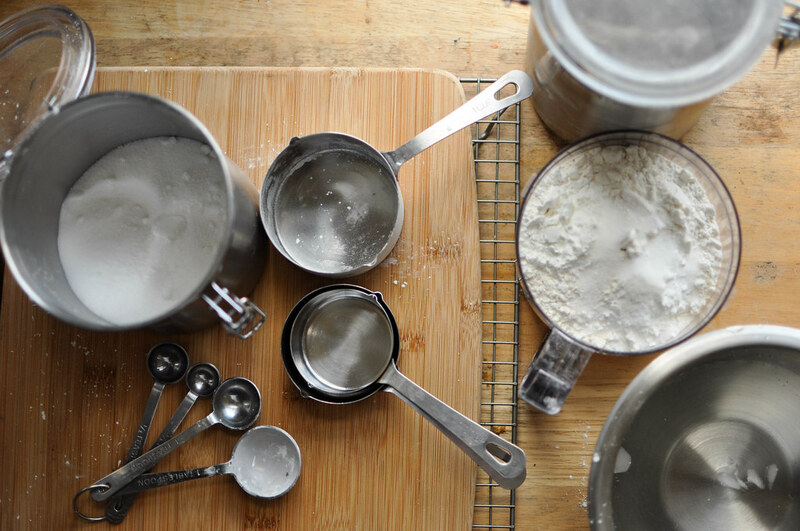 ADD WATER: Sprinkle 1 tablespoon water over mixture and pulse once quickly to combine; repeat, adding water 1 tablespoon at a time and pulsing, until dough begins to form small curds that hold together when pinched with fingers (dough should look crumbly and should not form cohesive ball). 3. FORM MOUND: Empty dough onto work surface and gather into rough rectangular mound about 12 inches long and 5 inches wide. 4. FRAISAGE AND CHILL: Starting at farthest end, use heel of hand to smear small amount of dough against counter, pushing firmly down and away from you, to create separate pile of dough (flattened pieces of dough should look shaggy). Continue process until all dough has been worked. Gather dough into rough 12 by 5-inch mound and repeat smearing process. Dough will not have to be smeared as much as first time and should form cohesive ball once entire portion is worked. Form dough into 4-inch square, wrap in plastic, and refrigerate until cold and firm but still malleable, 30 minutes to 1 hour. 5. 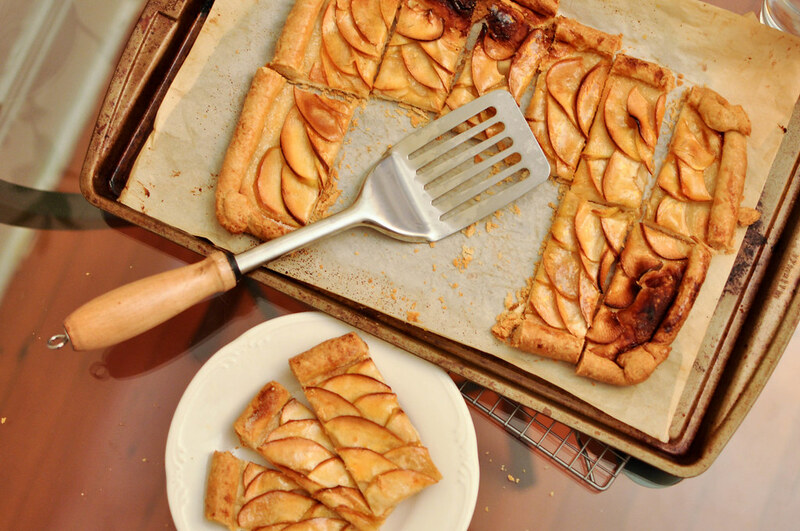 CUT APPLES: About 15 minutes before baking, adjust oven rack to middle position and heat oven to 400 degrees. Peel, core, and halve apples. 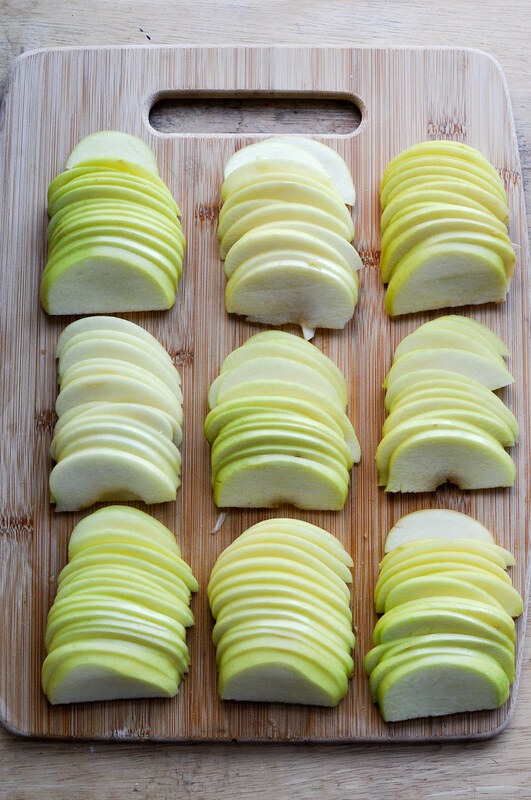 Cut apple halves lengthwise into 1/8-inch-thick slices. 6. 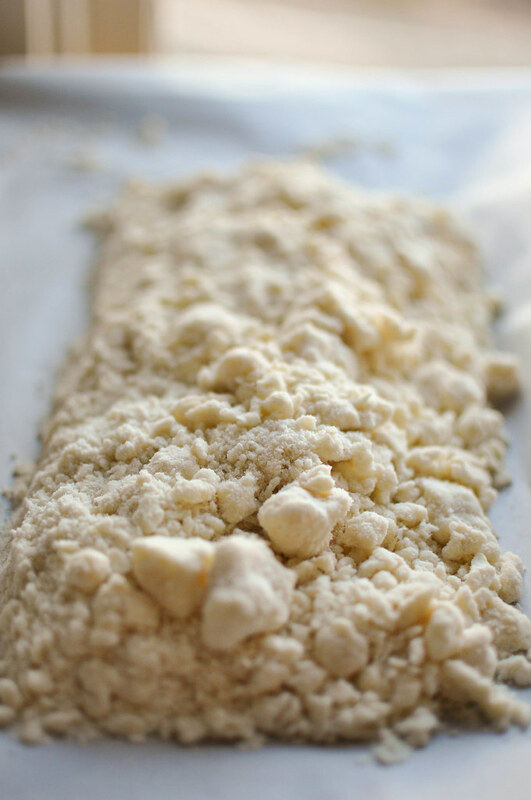 ROLL AND TRIM DOUGH: Place dough on floured 16 by 12-inch piece of parchment paper and dust with more flour. 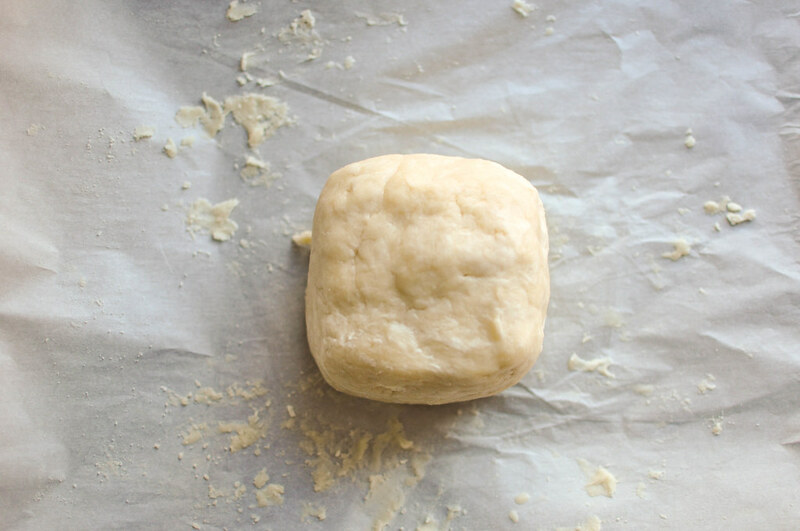 Roll dough until it just overhangs all four sides of parchment and is about 1/8 inch thick, dusting top and bottom of dough and rolling pin with flour as needed to keep dough from sticking. Trim dough so edges are even with parchment paper. 7. FORM BORDER: Roll up 1 inch of each edge and pinch firmly to create 1/2-inch-thick border. 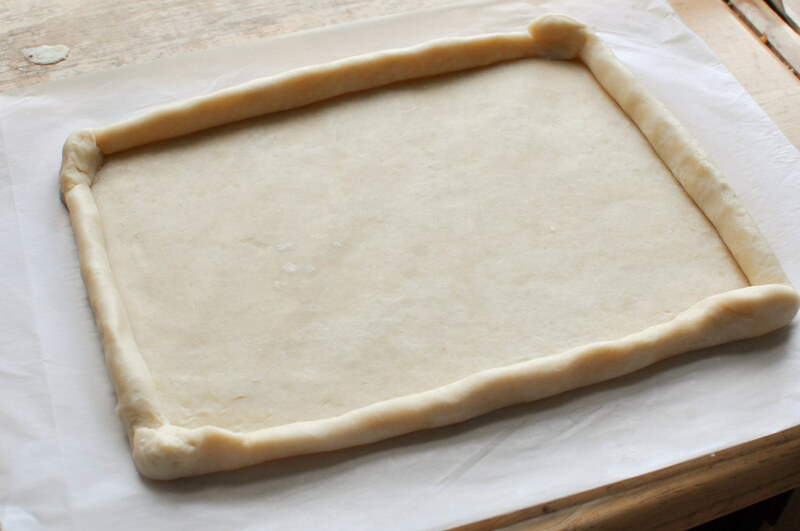 Transfer dough and parchment to rimmed baking sheet. 8. 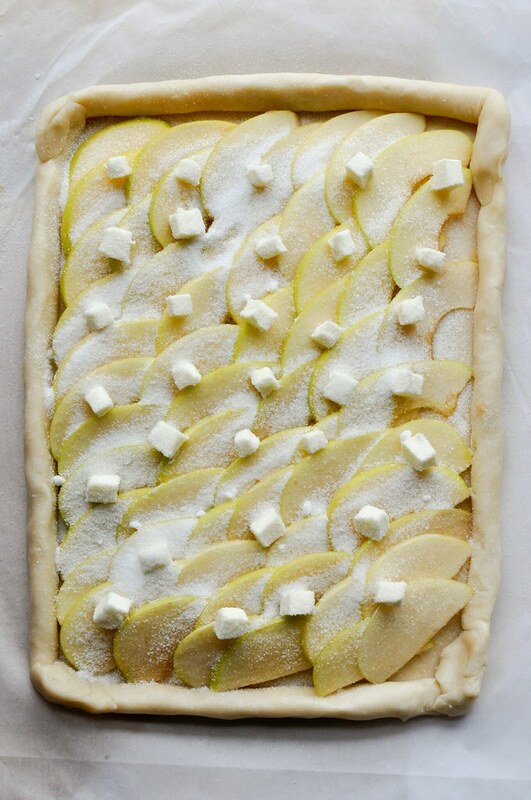 LAYER APPLES AND BAKE: Starting in one corner, shingle sliced apples to form even row across bottom of dough, overlapping each slice by about one-half. Continue to layer apples in rows, overlapping each row by half. Dot apples with butter and sprinkle evenly with sugar. 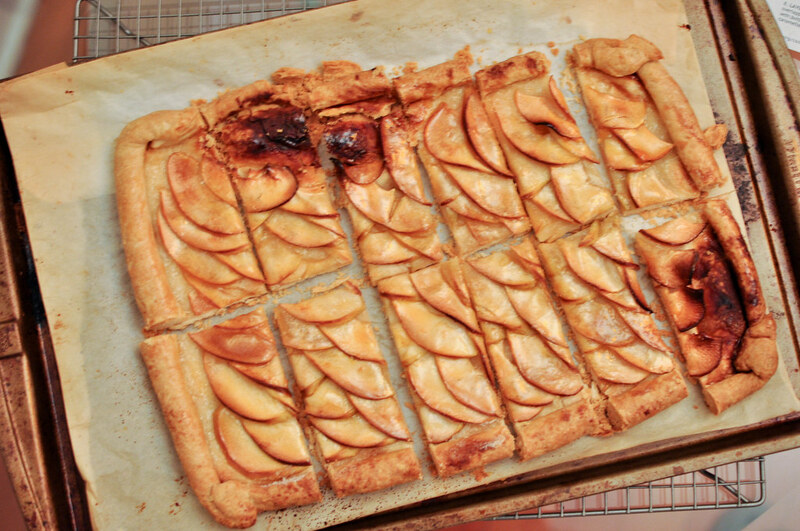 Bake until bottom of tart is deep golden brown and apples have caramelized, 45 to 60 minutes. 9. GLAZE: While galette is cooking, combine apricot preserves and water in medium microwave-safe bowl. Microwave on medium power until mixture begins to bubble, about 1 minute. Pass through fine-mesh strainer to remove any large apricot pieces. Brush baked galette with glaze and cool on wire rack for 15 minutes. Transfer to cutting board. Cut in half lengthwise and then crosswise into individual portions; serve.